This post is an update to our comprehensive guide for Email Marketing to Facebook.com email addresses. Please read it before reading this. Last month we did a comprehensive test on how to market to Facebook.com email addresses. Soon there will be millions of @facebook.com email addresses that people will start using very soon. Since it is a new email platform we tested different types of emails to see which one works and which one doesn’t. When we ran the tests a properly formatted email campaign didn’t show up on Facebook messaging, We have just done a test now and it is now showing the email properly as it is supposed to be seen. So you can start sending out your emails now. 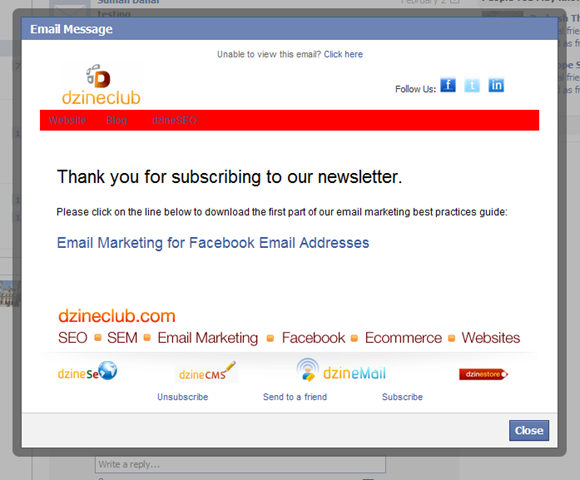 Here is a dzineClub email as delivered to @facebook.com email address. However that said, you still have to click on Expand to actually view the email so you might want to think about whether it is worth sending them a text email or a fully formatted HTML email. To view the full results and to download our Best Practice guide, please click on the banner below. Helps the customer enquire about the product at any stage of the purchase. If they were not sure about buying the product, your reply should help them make the decision. Make it easy and quick for the casual shopper to your online store. As long as you get paid for the product and it is easy for the customer to buy it, that is all that should matter. Also make sure that you have the option to create an account for easier repeat purchases. As you dig deeper into category, there should be options to refine your search based on different attributes. Colour, size, price etc. With latest zoom plug-ins and scripts, there is no excuse to not have a picture that can be enlarged and zoomed into. Most products also require multiple angle shots for best customer experience. Don’t make the shipping rates a last minute surprise (or shock) Inform your visitors from the start on how much it would cost them to ship the product. Customers are always wary of buying products online. Make sure that you have detailed the return policy and re-enforced it on the pages to keep them at ease. Set up alerts for products that are out of stock. When the product lands in the store, the customers get automatically notified. Show a list of related products. If a customer is already looking at a product, chances are that they will want a related product or look at a related product as an alternative. Make sure you have enough of the product pictures in real life scenarios. Think of IKEA for example. This makes a huge different in user perception.